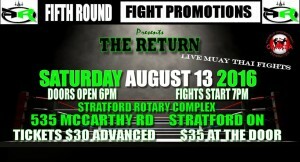 After 8 years, Full Rules Sanctioned Muay Thai Fights are coming back to Stratford.. 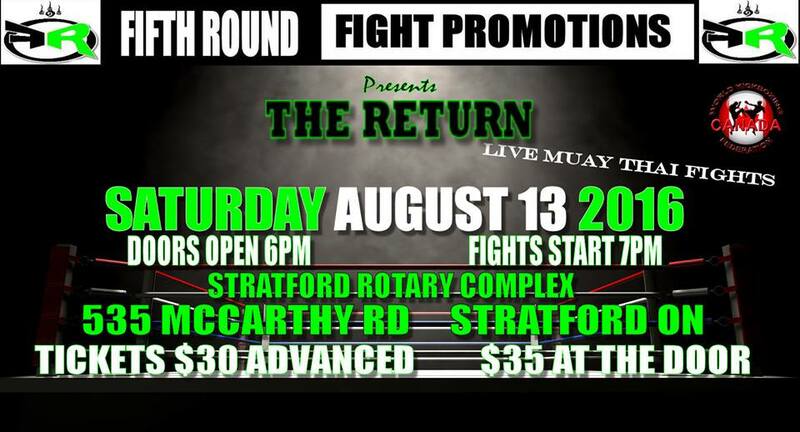 Presented by Fifth Round Fight Promotions this will be the BIGGEST combat sports event to come to Stratford and you WILL NOT WANT TO MISS OUT ON THE ACTION. The event will have 12 action packed fights that will include 3 five round A CLASS title fights! Bare Shin, no gear, elbows flying Muay Thai Boxing! Doors Open at 6pm fights at 7pm! Tickets $30 advance and $35 at the door! Contact Kru Joe Marchand Tipping on Facebook, or at info@fifthround.ca or call 226-779-2484 for VIP, Table or General admission info.